1) Mary Greenwood will be exhibiting her books at the Oldsmar Authors Showcase on Thursday, March 14, 2019, from 6:00 to 8:00 at Oldsmar Public Library, 400 St. Petersburg Drive East, Oldsmar, Fl. Mary Greenwood will be selling and signing her books, How to Negotiate Like a Pro, winner of 10 Book Awards, How to Mediate Like a Pro, winner of 12 book awards, and How to Interview Like a Pro, winner of 12 book awards. The goal of the Local Showcase is to create awareness of local writers and encourage local readers to interact with the local authors. 2) Mary Greenwood showcased her books at the Local Authors Showcase at the Palm Harbor, FL Public Library, 2330 Nebraska Avenue, on Saturday, January 19, from 1:00 to 3:00. The goal of the Local Showcase was to create awareness of local writers and talent. The Showcase encouraged readers to spend time with the authors to discuss their books. 3) How to Negotiate Like a Pro, How to Resolve Anything, Anytime Anywhere was a finalist in the "how to" category in the Next Generation Indie Book Awards. The awards ceremony was held June 22 at the Hotel Monteleone in New Orleans, which is one of three Literary Landmarks in the US, including the Plaza and the Olgonquin in New York City. Hemingway, Tennessee Williams and Faulkner all stayed there. 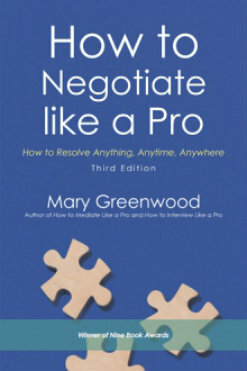 This is the tenth book award for How to Negotiate Like a Pro and the 24th book award for all Greenwood's books. 4) Mary Greenwood won First Place in Memoir for A Man's Spot, an essay about her first day at law school in 1968, in a writing contest sponsored by the South Florida Writers Association. Greenwood's Legal Memoir will be published in 2019. 5) The new third edition of How to Negotiate Like a Pro is updated and revised with a new chapter on How to Negotiate with Difficult People, which includes pathological liars, bullies and narcissists. Mary Greenwood is an Attorney, Mediator, Arbitrator, Negotiator and Author of three award-winning books: How to Negotiate Like a Pro; How to Negotiate Anything, Anytime, Anywhere; Winner of ten book awards, How to Interview Like a Pro, 43 Rules For Getting Your Next Job, Winner of 13 book awards; How to Mediate Like a Pro, 42 Rules for Mediating Disputes, Winner of 12 book awards. Greenwood has a BA and MA in English, a Law Degree and an LL.M. in Labor Law. Greenwood lives in St. Augustne Beach, Florida with her Boston terrier Annabelle. 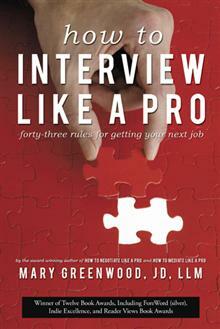 How to Interview Like A Pro, Reader's Choice, and Winner of twelve book awards. Ask good questions at the interview. How to Mediate Like a Pro,winner of twelve book awards. How to Mediate Like a Pro is based on Greenwood's experience as a Mediator in over 7000 cases. Greenwood lists each Rule and Script and offers a concise explanation on how and when to use it in Mediation.How to Mediate Like a Pro presents strategies and practical tips for the Mediation process. It will give you insight on how to deal with difficult parties, how to break an impasse and how to close the deal. After you read this book, you will be able to Mediate Like A Pro. Third Edition How to Negotiate Like a Pro: How to Resolve Anything, Anywhere, Anytime, Winner of nine book awards. Deal with someone who is a bully, narcissist or pathological liar. Find out what makes a good negotiator. With Greenwood’s forty-one rules, you will be soon be negotiating like a professional.